My goal is to make the best looking traditional wood axle yo-yos in the country. 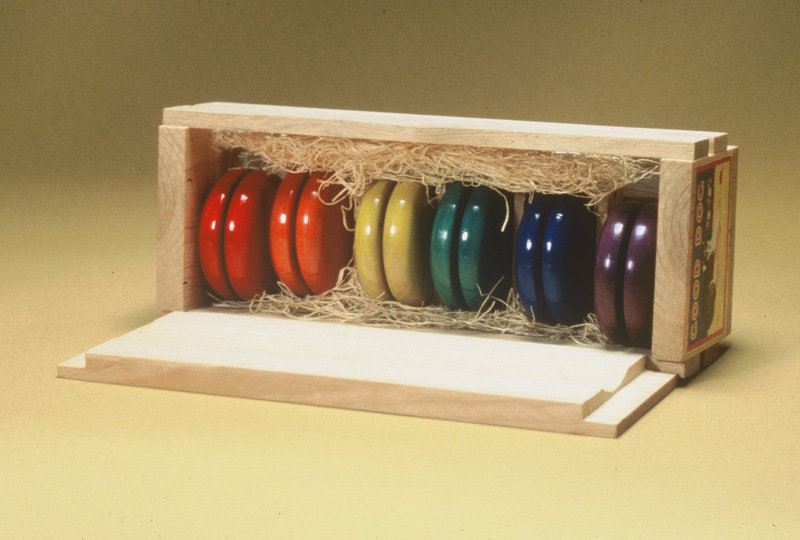 I make a tremendous variety of yo-yos, in various sizes and with roughly 20 different wood species. My yo-yos are made from recycled scrap wood from a variety of sources, such as discarded shipping pallets. I also make dominoes from recycled scrap wood. Boxes and crates to hold the yo-yos and dominoes are also available. these boxes and crates are decorated with labels inspired by fruit crate art of the early 20th century. The labels feature rescued dogs. The common theme is: rescued animals/recycled wood! My standard size yo-yo, a little less than 2 1/2″ in diameter, are slimmer and bigger in diameter than a lot of factory made yo-yos. Years ago, a person I would consider a pro-level yo-yoist told me that for yo-yos, “slimmer but bigger diameter is better” and I have adhered to that advice. This is my top selling line of yo-yos. What to put that perfect yo-yo in? An elegant presentation box or crate with labels inspired by early 20th centruy fruit crate art!